This program will provide a detailed, hands-on instruction on identifying grant opportunities and preparing effective proposals. Additionally, the training provides instruction on effective grants management techniques. This 2-day, detailed training presents an in-depth explanation of the grant development process from start to finish. The workshop format will feature both lecture sessions and group activities. Participants will attend several group sessions enabling them to meet and interact with others who have similar interests and needs. 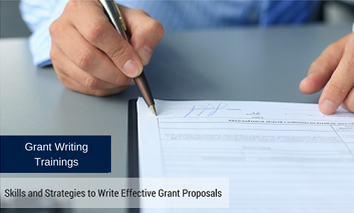 Specifically, participants will identify potential grant-writing partners and grant reviewers from their state and local area and will discuss relevant grant issues and strategies with other professionals from similar disciplines (such as education, mental health, social service, health care, law enforcement, etc.) To receive certification, upon completion, participants will be required to successfully complete an exam. This seminar addresses both practical and conceptual aspects that are important to the proposal-writing process. Emphasis is given to idea development, identification of the appropriate granting agency, how to write for reviewers, and tips and strategies of proven value in presenting an applicant’s case to reviewers. Topics will include operational and capital campaign strategies, overview of planned giving structures, review of available funding sources and the preparation of a grant proposal.